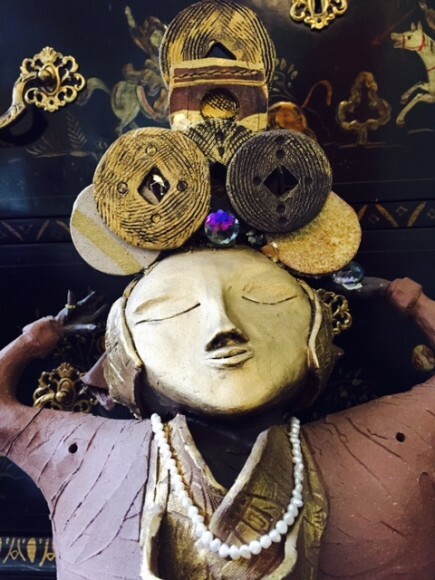 My sculptures and earrings are created from an internal sense of peace and balance. The feeling of the clay in my hands with the unknown discovery of what is created brings me to the present. I suppose they remind me of the silence and stillness that I sometimes need to remember. Clay is a process just like life. You never know what will come. The jewels and stones are used to bring interest and beauty. When I make my earrings I choose stones that I like and resonate to and I adorn my Sterling Beings with the same flavor of color. The kinesthetic Taurus nature in me loves to include the senses and to speak to the soul through art. While I have never taken an art class except in elementary school, the evolution of my sculptures has been effortless and satisfying for my creative nature. I like the dark chocolate and rich earth tones accented by gold leaf, pearls and whatever else attracts my eye. My true desire is for someone to feel the sacred in them and to be attracted to their own silence within. Many are sitting on people’s altars.They are there to remind us to let go into the stillness. 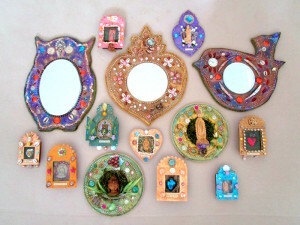 I have been creating mixed media Altars, Shrines and Mosaic mirrors for over 30 years; and have always been deeply drawn to and inspired by sacred art from around the world….specifically the shared journey of creativity and spiritual awakening found in all cultures since ancient times. I experience art-making as a form of creative prayer that is medicine for the soul of the giver and the receiver. I am passionate, grateful, and honored to share my inspiration and journey with others! All of my artwork is original and hand crafted with deep love – please enjoy!